We love clever mums here at Babyology and when they’re Australian, we love them even more. Like Allison, the clever Queensland mama who has created a brilliant sanity saving product for making grocery shopping with toddlers a little less stressy. The Colour In Trolley Liner is a trolley load of fun for littlies. 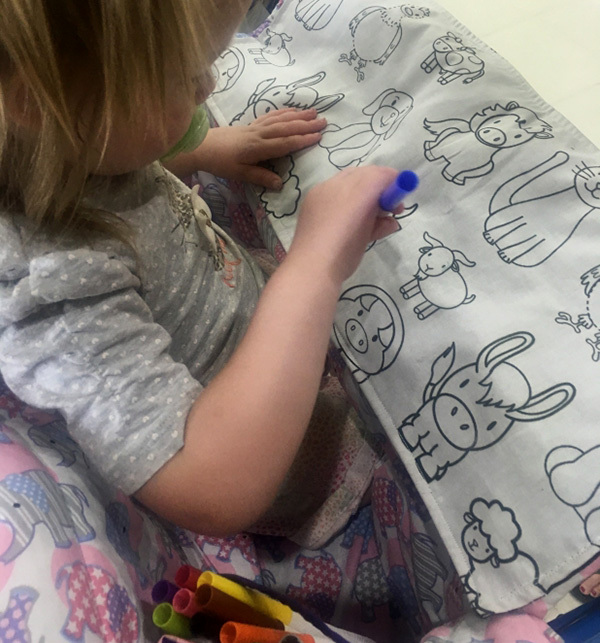 A trolley liner with a difference, Allison has created the ultimate snap-in colouring panel designed for kids to hone their colouring skills while you do the shopping. The reversible panel includes a side of animals to colour and a plain side to doodle as they see fit. When you get home, simply throw the panel in with your next load of washing and you can start with a fresh blank canvas next time. A disclaimer, there are markers involved, but I think you’ll agree that’s a small price to pay for being able to get a necessary job done without dropped phones, thrown snacks, tears and endless moans of ‘I’m bored’. The Colour In Trolley Liner is available in custom fabrics and priced $95 (single trolley) and $105 (double trolley). Order direct from Two Tiny Stitches.